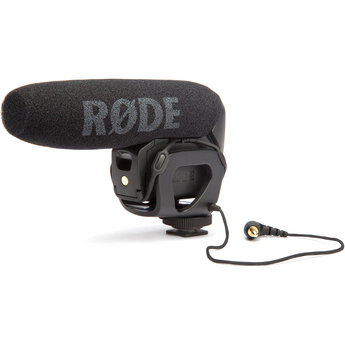 The Rode VideoMic Pro Hotshoe Microphone sports an ultra compact and lightweight design that is ideal for DSLRs with 3.5mm audio ports. The microphone has a broadcast-quality condenser capsule with a supercardioid pickup pattern to capture audio from the front, while minimizing pickup from the sides and rear. An integrated shockmount and foam windscreen minimize handling and wind noise. This mic can also be plugged into external audio recorders that have 3.5mm ports, such as the Zoom H6 Handy 6-Track Recorder. This microphone is ideal for DSLR videography. • This microphone requires a 9V battery for operation, which is not included with your rental. • The VideoMic Pro features a 3.5mm plug for connection to DSLR cameras and camcorders. Check for this port on your DSLR before renting. The hot shoe is actually a cold shoe mount used to hold the mic in place and does not interface with the camera other than through the 3.5mm plug. • This mic can also be plugged into external audio recorders that have 3.5mm ports. • This mic is a mono shotgun mic. If you need stereo, see the Rode Stereo VideoMic Hotshoe Microphone. • The 3-way level control offers -10 dB, 0 dB, and +2 0dB modes, letting you set the perfect level regardless of what device the mic is connected to.